Our favourite woolly friend is back – at least his Fairtrade Easter Egg is. 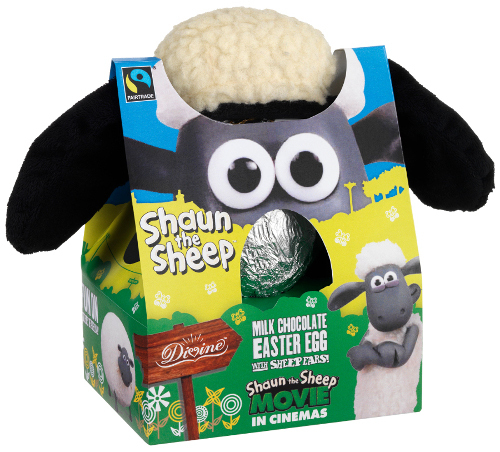 Shaun The Sheep is nominated for an Academy Award this year for Best Animated Feature Film, and to celebrate we’re stocking more of the delicious Fairtrade Shaun The Sheep Easter eggs from Divine – each one coming with its own set of sheep ears! If you haven’t seen the film yet then you should check it out – it’s out on DVD now! If you’ve seen the TV programme then you know just what to expect – Shaun and his friends from the farm getting into mischief. This time Shaun gets bored of doing his normal jobs around the farm and decides to take the day off to have some fun and ends up in the Big City with his friends and they need to get back to the farm! It’s a great one for kids and adults alike. Not only is Divine chocolate delicious, it’s also Fairtrade certified and co-owned by the farmer members for the Kuapa Kokoo cooperative in Ghana, the people who grow the cocoa for each bar of Divine. Because they co-own the company, they are given a share of the profits and are able to have their say in the running of Divine Chocolate ensuring nobody is exploited at any point of the supply chain. Don’t miss out on your Shaun the Sheep Easter egg from Divine this year, when they’re gone, they’re gone! Previous story The easiest chocolate mousse recipe!